Apron There are 14 products. Apron bib, 3 front pockets + 1 pocket pencils, 65/35 polycotton, 245g / m², height 70 cm (height 90 cm with neckband). Currently exists in black, burgundy, red and white. Black bistro apron 65% polyester and 35% cotton, 245 gr/m². Width 95 cm, height 70 cm, length 2 black cords +/- 95 cm. Apron without pockets. Wash 60°C. Apron bib united, 65/35 polycotton. Apron with central pocket, button adjustment pressures and flap back for better support. Width 84 cm, height 80 cm without cord, height 110 cm with adjustable neck cord to largest. 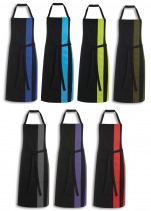 This apron is available in 9 colors: fuchsia, gray, orange, turquoise, plum, aniseed green, red, black and purple. Black bib apron, 65/35 polycotton, 245 gr/m². 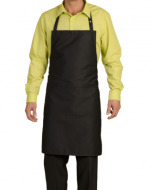 Apron: width 68 cm, height 84 cm without cord, height 115 cm with adjustable neck cord to largest. Apron with one large rectangular central pocket width 31 cm and 18 cm, neck cord by setting pressures. 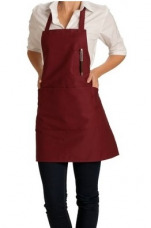 Two-tone rectangle apron without pocket in 65% polyester and 35% cotton, height of 49 cm and 80,5 cm wide, one size. Apron with black cords made in the same fabric as the apron. Apron washable up to 60°C, easy care. Bib apron united, 65/35 polycotton, a central pocket. Height 82 cm and Width 90 cm.The deck has drawstrings to adapt the cord around the neck. 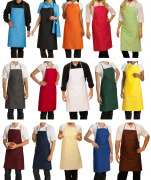 This apron comes in 15 different colors: white, ivory, yellow, orange, fuchsia, red, maroon, lime green, dark green, turquoise, blue, navy, mocha brown, gray and black. Rectangle apron without pocket in 65% polyester and 35% cotton, height 50 cm, one size. Apron with cords made in the same fabric as the apron. 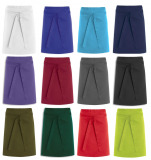 Apron washable up to 85°C and also supports cleaning in industrial laundry. Rectangle apron with pocket in 65% polyester and 35% cotton, height 50 cm, one size. Apron with cords made in the same fabric as the apron. 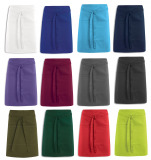 Apron washable up to 85°C and also supports cleaning in industrial laundry. Bib apron with pocket in 65% polyester and 35% cotton, height 92 cm, one size. Apron with cords made in the same fabric as the apron. Apron washable up to 85°C, easy care and also supports cleaning in industrial laundry. 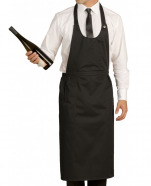 Bib apron without pocket in 65% polyester and 35% cotton, height 92 cm, one size. Apron with cords made in the same fabric as the apron. Apron washable up to 85°C, easy care and also supports cleaning in industrial laundry. Two-tone bib apron without pocket in 65% polyester and 35% cotton, height of 92 cm and 80 cm wide, one size. Apron with black cords made in the same fabric as the apron. Apron washable up to 60°C, easy care.